Persians and Exotics come in many colours. We specialize in the colours Chinchilla and Shaded Silver. Yes, these are colours. Many people think that Chinchilla is a breed, but no, in our case the breed is Persian or Exotic. Chinchillas are known as "Tipped" cats. Shaded Silvers as "Shaded"
To the untrained eye these colours are very similar, the difference is in the length of the tipping. In a chinchilla the black tipping is around 1/8 of an inch, the shaded silver has tipping of around 1/4 of an inch giving it a slightly darker appearance than the chinchilla. Below is a copy of the Breed Standard for Persian and Exotic Cats in Australia. Also the Colour standard for Chinchilla and Shaded Silver. Please take into account that the standard is written for show cats. This is how it is imagined a perfect cat should look but not too many cats are perfect! Your Pet Kitten may not quite meet the written standard, it may be something small like a colour fault or his tail may be just a little too long (or too short), his nose may be a little long. Of course this does not affect the ability of your kitten to be a lovely Pet. Exotic Shorthairs are just Persians in their underwear, and sometimes they are known as the Lazy Mans Persian or Teddy Bear Cats. The type standard is the same for all Persians and Exotic Shorthairs. The Persian/Exotic Shorthair is a medium to large cat which feels heavier than it looks. Its primary features are its sweet expression set in a round face, its short thickset muscular body and its docile nature. 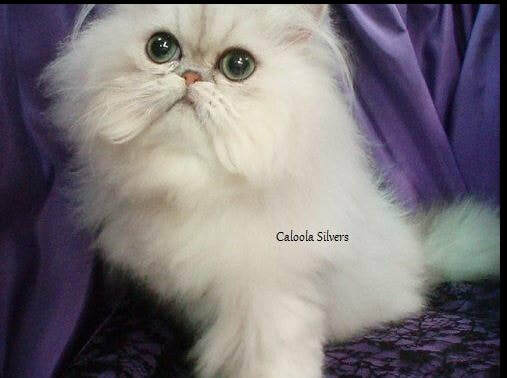 The Persian has a strikingly long coat; the Exotic Shorthair a short, dense, plushy coat. There should be no sacrifice of quality for the sake of mere size. Males are generally larger than females. round and massive with great breadth between the ears. Forehead rounded. Face and underlying bone structure round. Depth of skull to be as great as possible, with the back of the head well rounded. Profile as straight a line as possible from the eyebrows, through the tip of the nose, both jaws and the chin, with an indentation marking the nose stop. Head well set on a short, thick neck. small and neat with rounded tips, not unduly open at the base, set well apart and low on the head, fitting into the rounded contour of the head. large, round, bold and of equal size. Set well apart and brilliant, giving a sweet or pleasing expression to the face. short and broad to the tip with a distinct stop or break. The nose should not taper and should end with a nose leather of width equal to that of the nose. Nostrils to be large and open, allowing for ease of breathing. Ideally, the centre of the nostrils should not exceed the height of the lower lid of eyes. full, fitting into the rounded contours of the head. the muzzle forms a broad, downward-sweeping curve, which is part of the sweet or pleasing expression. The broad and powerful jaws completely fill the contours of the muzzle. firm, broad and deep, in a vertical line with the tip of the nose. short and thick, in proportion to the head and body. cobby, thick-set and low on the legs, deep in chest, equally massive across the shoulders and rump, with a well-rounded rib cage. Medium to large in size and is heavier than its appearance indicates. Back to be level without dip or hump. Body condition solid to firm. short, full and in proportion to the body. Carried without a curve. short, thick and strong, forelegs straight. The Tipped Silver pattern has a pure white undercoat, with the head, ears, back, flanks and tail evenly and lightly tipped with colour, giving a characteristic sparkling appearance. The face and legs may be very slightly shaded with tipping, and ideally the hocks are unblemished. The ear tufts, chin, chest, stomach and under the tail must be pure white. Lips are outlined with the same colour as the eye outline. Tabby markings is a serious fault as is rufousing. Black tipping over a pure white undercoat. Blue-green or green, green preferred. Eyes outlined with a narrow band of black. Brick red, outlined with a pencilling of black. The Shaded Silver pattern has a pure white undercoat, but the overall effect is much darker than the Tipped pattern. It has a mantle of coloured tipping shading gradually down the face, sides and tail from dark on the ridge to pale on the chin, chest, stomach and under the tail with lips outlined in Black. Shading commonly exists on the hocks and is to be the same on the head. Lips are outlined with the same colour as the eye outline. Rufousing or Tabby markings are considered a serious fault except in cream or red tipped Silver cats. Mantle of black tipping over a pure white undercoat. Green, blue/green, green preferred. Eyes outlined with a narrow band of black.